Preheat oven to 350 degrees. Coat 12 muffin tins with cooking spray; set aside. In large bowl, combine potatoes, onions, cheese, salt, and pepper. Toss lightly with a fork. Drizzle on olive oil. Toss with fork again until mixture is well combined. Spoon mixture evenly into 12 muffin cups. With the back of the spoon, apply gentle pressure to pack mixture into each cup. Bake for 60-75 minutes in lower third of oven. Let rest for 5 minutes, run a small knife or spatula around the edge of each cup, making sure the edges are loosened. Gently lift each potato cup out, invert it, place on serving plate bottom side up. Good served warm or room temperature. MAKE AHEAD FOR COOKING LATER: Combine mixture, spoon it into muffin tins, cover with plastic wrap, and refrigerate until ready to bake. Remove from fridge 30 minutes before baking time. May be made the night before to cook and serve for breakfast the next day. MAKE AND COOK AHEAD FOR REHEATING LATER: These are best when eaten freshly baked. However, they can be baked ahead of time, refrigerated or frozen, and reheated before serving. They lose some of their crispiness when reheated, but the texture and taste is still good. FOR BITE-SIZE TATER TOTS – make them in mini muffin pans. That seems like along time to bake 60 -70 min. The mini size takes approx. 55 min. That does sound like a long cooking time?!?! It also said with the make ahead, Take from fridge 30 mins before cooking? These look FABULOUS! I’m definitely going to try them soon – thanks for posting! Those look delicious! A great Quick and Easy breakfast! I’m thinking of adding some chopped up bacon and tomatoes to this as well, think it would work? I love this idea! I have tried these twice and both times I could not get the darn things out of the pan! They were so delicious but the presentation was definitely lacking! Any tips?? Perhaps you can try lining your muffin pans with paper baking cups. You can even spray paper cup with a bit of oil too if necessary. I think an hour is good timin. I’ve made them before but added one homemade turkey sausage and an egg. The recipe I used called for less cooking Ike however I found that I had o cook them for about an hour to actually fully cook the potatoe. If you have a problem getting them out and you didn’t use the bagged potatoes you should make sure you rinse them more and dry well. The starch will really stick. As for an hour cooking time, yes. But you could parboil the regular potatoes and then shred them and do this. That would definitely cut down on a cooking time. I can’t imagine the Simply Potatoes would take as long as regular potatoes though. Love your easy to do recipes. This is an easy one, really! Will be trying with sweet potatoes. Thanks for sharing..
I’m making these right now for brunch! Sounds so yummy. It does sound like a long cooking time, but if you’ve ever made these potatoes as directed on the bag it takes a while to cook/brown. It’s uncooked potato . Sounds yummy! Can’t wait to try it! 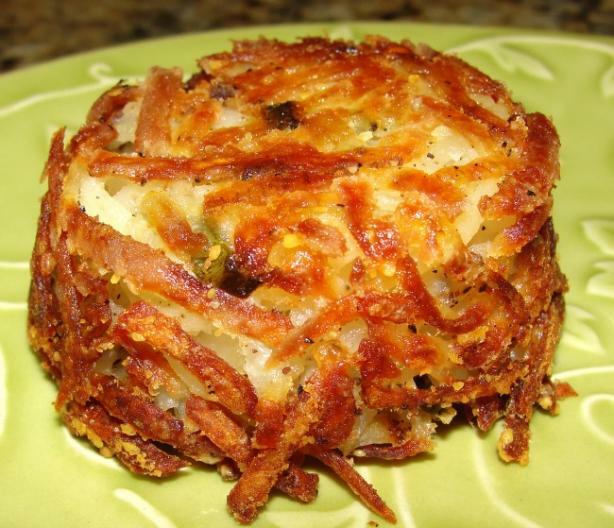 I made these tonight – super easy with the already shredded potatoes. I didn’t have any green onions so I grated regular onion and that worked great. Next time I might add more onion. I also added some italian herbs. Spraying the muffin tin well worked just fine – no sticking. They popped right out. I baked for 55 minutes and could have probably done even a little less time since they were quite crispy. Very good and very easy! Made them this morning with a spinach , feta, mushroom fritatta for Christmas morning. Would cheddar cheese work in these? I prefer cheddar over Parmesean.